Decades ago, I tried using therapeutic magnets (also called bio magnets) for muscle pain. I was surprised that they seemed to work. I recently tried them again and had a similar reaction. The basic questions are: Do therapeutic magnets really work and if so, how and why? Whereas I think that they do work, I have no scientific proof—only a hypothesis concerning the mechanism for how they do work (if they do), based on the elementary physics of currents and magnetic fields. First, I will provide some basic information about magnets and then present my hypothesis. Therapeutic magnets vary from little buttons about 5 mm in diameter and 1 mm in height to much larger sizes. They also come in sheets and even in large pads on which to sleep. The buttons are stuck on circular adhesive plasters and placed on the painful spot for about 24 hours. Some websites on magnet therapy warn that the north end of the magnet should face the skin. 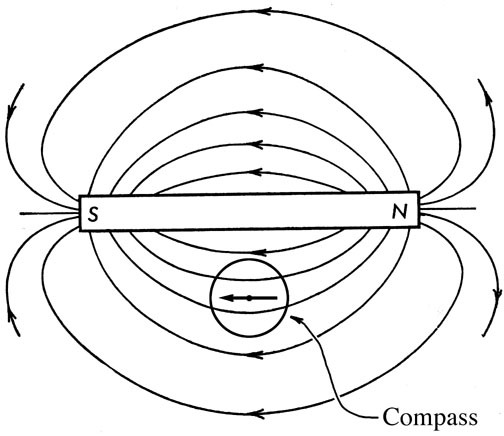 However, in testing the three different brands of magnets that I have by using a compass, I found that they were all oriented with their south sides toward the skin; that is, the side facing the skin was attracted to the north-seeking end of the compass needle, and that end is what scientists call a north magnetic pole. I visited several websites on the subject and found what I would call scientific gobbledygook. Some of these sites seem to lack even an eighth-grade understanding of magnetism and are confused about what end of a compass needle has a north magnetic polarity (it’s the end that points northward!). One website actually stated that magnetism keeps planets and other celestial bodies orbiting and rotating, which is absurd! So I saw that I was not going to find any scientific or reliable information by visiting websites on therapeutic magnets. Therefore, some clarification is required before attempting any kind of analysis of the effects of therapeutic magnets. 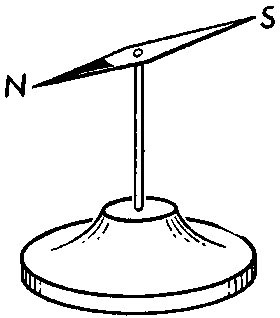 Compasses were first utilized by pivoting a magnetic needle at its center and allowing it to rotate (Fig. 1). It was found that one end of the needle pointed approximately in a geographic direction that had for centuries been called north. That end of the magnet was then called north or north-seeking, meaning that that end of the needle pointed approximately to geographic north (the place where the axis of the earth’s rotation intersects the northernmost part of the earth). Scientists define the end of the compass needle that points northward as a north magnetic pole. Fig. 1. A primitive compass needle. The darkened end, marked N, points northward and is defined by scientists a north magnetic pole. A simple example of a magnetic field is that produced by a bar magnet. Its magnetic field is found by taking a compass and placing it at various locations near the magnet. The direction of the magnetic field at any location is defined as the direction that the compass needle points at that location (Fig. 2). 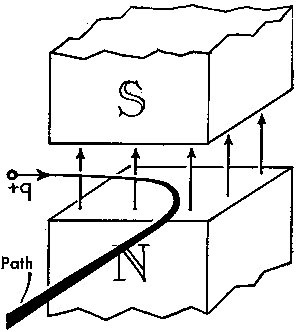 Note that the lines of magnetic field are directed away from the north pole of the bar magnet and toward its south pole. Moreover, the north end of the compass needle orients itself to point toward the south pole of the magnet. Fig. 2. The magnetic field around a bar magnet. Note that the field is directed from north to south. The north end of a compass needle is attracted by something seemingly in the arctic circle near the geographic north pole. The place in the arctic circle where the magnetic field is vertical is termed the “north magnetic pole” to distinguish it from the north geographic pole. Similarly, the place in the Antarctic circle where the magnetic field is vertical is termed the “south magnetic pole” to distinguish it from the south geographic pole (Fig. 3). It should be noted that north and south magnetic poles are geographical locations on the earth, and the words north and south are descriptive of these locations and not any actual magnetic polarity. In fact, there can be no reference to north and south magnetic poles of the earth that would be analogous to those at the ends of a thin, long bar magnet because the bar magnet equivalence of the earth would only be a tiny one at its center (no magnetic poles at the earth’s surface but deep inside, as in Fig. 3b). When a moving charged particle is exposed to a magnetic field whose direction is perpendicular to the charge’s motion, it experiences a magnetic force. 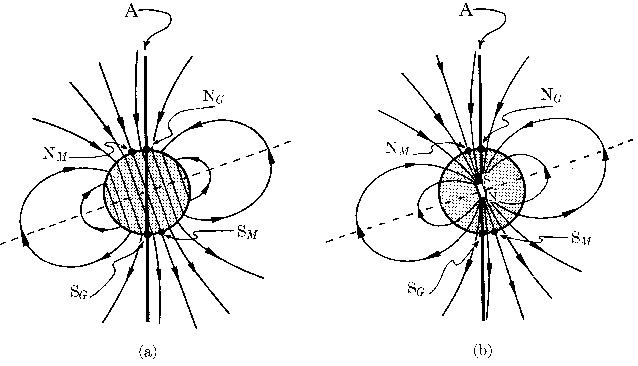 The direction of that force is perpendicular to the plane formed by the motion of the particle and the magnetic field (Fig. 4). Fig. 4. The Deflection of a positive charge by a magnetic field. The direction of the magnetic force is perpendicular to the plane formed by the motion of the particle and the direction of the magnetic field. First consider what happens when a muscle is overused or stressed. The tension and toxic metabolic byproducts of such muscles inflame motor nerves, which then send neural stimulation that causes the muscle to tense more. That produces more toxic byproducts, and so there is a painful, vicious cycle—painful because sensory nerves are also over-transmitting. Both motor and sensory nerves involving muscles operate through electrical currents, which travel along the length of the nerve, essentially parallel to the skin. Pasting a magnet on the skin above the traumatized region introduces a magnetic field perpendicular to the nerve current. The result is that neural currents may be deflected and thereby disrupted, reversing the vicious cycle and alleviating the muscular congestion and pain. Those who promote the therapeutic use of magnetism warn that undesirable consequences can occur unless what they call the north end of the magnet faces the skin. At the same time, they insist that the end of the compass needle that points northward is a south magnetic pole, so their definition of magnetic poles is evidently opposite to the one that scientists use. Regardless of the definition used, the side of the magnet that is supposed to contact the skin is the side to which the “north-seeking” end of compass needle points. It would be easy to scientifically test whether the magnetic polarity makes any difference. The mechanism just proposed implies that the polarity should not make any difference. Another scientific test would be to measure whether nerve action is suppressed by the introduction of a magnet near the nerve. Of course such a test would require a medical laboratory. *From James A. Richards, Francis W. Sears, M. Russell Wehr, and Mark W. Zemansky, Modern College Physics, Addison-Wesely Publishing Company, Reading, MA1960, p. 538.